It was Jennifer Belton's first trip to Alaska where she came in contact with a type of ivory that she had never seen before, fossilized walrus tusk and mammoth bone and tusk. 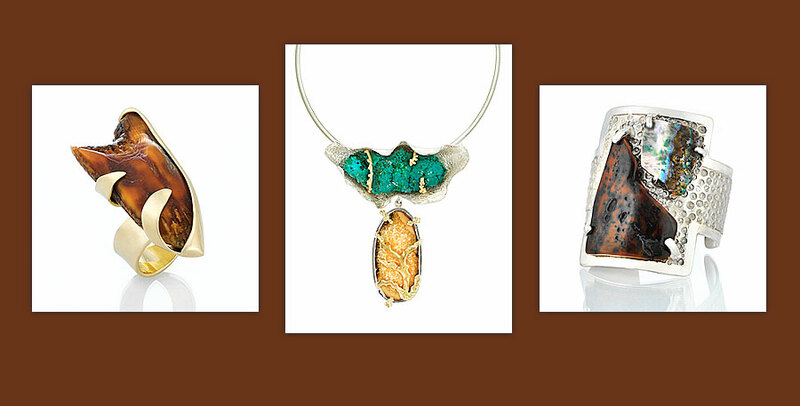 This unusual type of ivory marked the birth of jb dzyne and inspired Jennifer to return to her true passion of jewelry design and craft a line of jewelry mixing the rustic earthy hues of the ivory with gold, silver and platinum elements to create a striking visual statement. Unavailable anywhere else, these signature creations are Jennifer's alone. Jennifer's designs are created to guide the spirit to a magical place; when mind, body and soul seek peace, the journey transcends the extraordinary. Once you arrive, an overwhelming sense of calm allows you to let go and open yourself to the wonderment of nature. Nothing else puts a new spin on your style the way a perfectly chosen piece of jewelry can. Jennifer's goal is not to make jewelry that represents herself only, but rather specialized pieces that have been created to reflect the personal style and self-expression of her clients. The ivory used in Jennifer Belton's work originates from ancient Walrus and Mammoths. Walrus ivory is 1,000 to 12,000 years old while Mammoth ivory is 11,000 to 40,000 years old. Fossilized ivory is a natural process. No harm was done to any animals to procure these artifacts. Create a mood, set the tone, and change your look. Jennifer welcomes requests for custom designs and commissioned pieces.